In the days of slave trading, Cape Verde received its first occupants: West African slaves brought over to do the Portuguese colonists' dirty work. It also became a significant strategical stopping-point for America-bound slave ships from West Africa. Though the slave trade has long since come to an end, Cape Verde remains an important midway port. An increasing number of tourists are discovering the joys that Cape Verde itself offers. Cape Verdeans are descendant of Portuguese and African lines and both cultures infuse the islands' lively but relaxed way of life. The balance between late-night parties at the bars and clubs in Mindelo, and the day time activities of hiking or diving to enjoy Cape Verde's natural beauty is what makes the archipelago such an enthralling destination. Before the arrival of Europeans, the Cape Verde Islands were uninhabited. In 1462, Portuguese settlers arrived at Santiago and founded a settlement they called Ribeira Grande Ribeira Grande was the first permanent European settlement in the tropics. The Portuguese named the islands Cabo Verde, after the nearby Cap Vert on the Senegalese coast. In the 16th century, the archipelago prospered from the transatlantic slave trade. Praia became the capital in 1770. With the decline in the slave trade, Cape Verde's early prosperity slowly vanished. However, the islands' position astride mid-Atlantic shipping lanes made Cape Verde an ideal location for re-supplying ships. Because of its excellent harbour, Mindelo became an important commercial center during the 19th century. In 1951, Portugal changed Cape Verde's status from a colony to an overseas province in an attempt to blunt growing nationalism. Nevertheless, in 1956, Amilcar Cabral, a Cape Verdean, and a group of Cape Verdeans and Guineans organized (in Portuguese Guinea) the clandestine African Party for the Independence of Guinea and Cape Verde (PAIGC), which demanded improvement in economic, social, and political conditions in Cape Verde and Portuguese Guinea and formed the basis of the two nations' independence movement. Moving its headquarters to Conakry, Guinea in 1960, the PAIGC began an armed rebellion against Portugal in 1961. Portuguese Guinea declared independence in 1973 and was granted de jure independence in 1974. Immediately following the November 1980 coup in Guinea-Bissau, relations between Cape Verde and Guinea-Bissau became strained. Cape Verde abandoned its hope for unity with Guinea-Bissau and formed the African Party for the Independence of Cape Verde (PAICV). Problems have since been resolved, and relations between the countries are good. The PAICV and its predecessor established a one-party system and ruled Cape Verde from independence until 1990. Opposition groups came together to form the Movement for Democracy (MPD) in Praia in April 1990. Together, they campaigned for the right to contest the presidential election scheduled for December 1990. The one-party state was abolished September 28, 1990, and the first multi-party elections were held in January 1991. The MPD won a majority of the seats in the National Assembly, and MPD presidential candidate António Mascarenhas Monteiro defeated the PAICV's candidate with 73.5% of the votes. Legislative elections in December 1995 increased the MPD majority in the National Assembly. The party won 50 of the National Assembly's 72 seats. A February 1996 presidential election returned President Monteiro to office. Legislative elections in January 2001 returned power to the PAICV, with the PAICV holding 40 of the National Assembly seats, MPD 30, and Party for Democratic Convergence (PCD) and Party for Labor and Solidarity(PTS) 1 each. In February 2001, the PAICV-supported presidential candidate Pedro Pires defeated former MPD leader Carlos Veiga by only 13 votes. The Cape Verde archipelago is located in the Atlantic Ocean, approximately 570 kilometres (350 mi) off the coast of West Africa, near Senegal, The Gambia and Mauritania, and is part of the Macaronesia ecoregion. It lies between latitudes 14° and 18°N, and longitudes 22° and 26°W. The islands, covering a combined area of slightly over 4,033 square kilometres, are principally composed of igneous rocks, with volcanic structures and pyroclastic debris comprising the majority of the archipelago's total volume. The origin of the islands' volcanism has been attributed to a hotspot, associated with bathymetric swell that formed the Cape Verde Rise. The Rise is one of the largest protuberances in the world's oceans, rising 2.2 kilometres in a semi-circular region of 1200 km², associated with a rise of the geoid and elevated surface heat flow. Most recently erupting in 1995, Pico do Fogo is the largest active volcano in the region. It has an 8-kilometre diameter caldera, whose rim is 1,600 metres above sea level and an interior cone that rises to 2,829 metres above sea level. The caldera resulted from subsidence, following the partial evacuation (eruption) of the magma chamber, along a cylindrical column from within magma chamber (at a depth of 8 kilometres). Extensive salt flats are found on Sal and Maio. On Santiago, Santo Antão, and São Nicolau, arid slopes give way in places to sugarcane fields or banana plantations spread along the base of towering mountains. Ocean cliffs have been formed by catastrophic debris avalanches. Cape Verde consists of 10 islands and a handful of small islets. São Vicente - With the cultural capital of Mindelo. Santa Luzia - Santa Luzia is uninhabited but can be visited as a day trip from São Vicente. Sal - Has great beaches, water sports and resorts aplenty. But little else. Boa Vista - Even nicer beaches. The southern island group (Sotavento) is made up of the remaining islands. 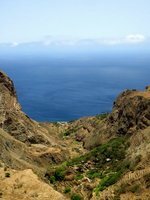 Santiago - The first island settled in Cape Verde. It holds the current capital Praia, the original capital Cidade Velha, and the bulk of the nation's population. Fogo - A spectacular volcano island which erupted as recently as 2014. Brava - A small island only accessible by boat and is a great place to get away from it all. Praia is the capital located on the island of Santiago. Mindelo - port city on São Vicente, probably the country's liveliest. Cidade Velha (Ribeira Grande) - A historic town on Santiago. Espargos - the capital of Sal where the airport is and Santa Maria is the main tourist area at the south of the island. Assomada - the seat of municipality of Santa Catarina on Santiago. Santa Maria - former administrative capital and the most populous city on Sal. São Filipe - capital of Fogo. White sand beaches on the island of Sal. Imposing volcanic peaks on Sao Nicolau and Fogo. Fogo is the highest point at over 2,800 metres above sea level. The last eruption of this volcano dates back to 1995 but you have to be really unlucky to witness another one while ascending to the top, possible in several hours. Bring a guide! Verdant hillside and jungle on Santiago. Conditions in Cape Verde are excellent for a variety of watersports, particularly sailing and windsurfing. Most watersports activities are based on the island of Sal. A Portuguese colony for nearly 500 years, the islands are home to a number of significant historic sites. These are in clearest evidence at the Cidade Velha, a site which is on the UNESCO World Heritage List and located on the island of Santiago, where some 17th century buildings remain. From here you can go up a steep hill to Fortaleza Real de São Filipe. Brava Island - good island for hiking and beaches on the west side of the island. Densely populated but pure Cape Verde! February sees the most colorful and spectacular festival of the island’s calendar and is one of the best times of the year to visit Cape Verde. No matter where you go, it is virtually impossible to escape the party and endless music in full swing. The most elaborate and hedonistic celebrations take place on the streets of Praia and Mindelo where everyone pulls out their fancy costumes and puts away their inhibitions. The dancing, drinking and debauchery goes on for days, with music, fireworks and huge parades. Started in 2009, the Kriol Jazz Festival is held in the capital of Praia every April and attracts artists from around Cape Verde and abroad. The event promotes Cape Verde’s rich musical heritage, which hails from Africa, the Caribbean and Europe. Performances are held at locations around the city and get the community moving to the music all weekend long. A passionate affair which incorporates the country’s traditional pastimes, bonfires are ignited to ward off evil spirits and bring fertility to the fields, while dancing, singing and street parties take place in San Antonio June 24th every year. A raucous event which is celebrated on every island, Independence Day festivities are held July 5, commemorating the day the country gained its freedom from Portugal. Colorful celebrations complete with serious drinking the local favorite grogue and feasting are the norm and the fun carries through into the evening. It’s a great time to visit and experience the pride and light-heartedness of the locals. Held for a weekend in September, the enjoyable Cape Verde music scene has evolved into an exciting and fast-growing event over the years, attracting local and international artists. A fusion of many different styles and influences, it’s a great spectacle. Cape Verdean people from across the islands, as well as tourists head to Santa Maria Beach to pitch tents and setup camp for the weekend. When the sun goes down, bonfires are lit and the party rages through the night. Cape Verde has a very pleasant climate, with warm and sunny conditions year round. It is mostly dry throughout the year as well, except for the short August to October 'rainy' season. Note that much of the islands, especially the flatter ones like Sal, can be a little windy, but that's sometimes good for watersports. Temperatures are mainly in the 25 °C to 30 °C range during the day and nights are warm at 19 °C to 23 °C. May to November is slightly warmer than the December to March period. TACV Cabo Verde Airlines is the national airline of Cape Verde and is based at Amílcar Cabral International Airport (SID) at the island of Sal and at Praia International Airport (RAI) near the capital Praia on Santiago Island. Connections to Banjul, Boston, Dakar, Fortaleza, Lisbon and London are served from Praia. From Sal, there are considerably more cities in Europe served with several dozens of airlines. Destinations include London, Copenhagen, Oslo, Stockholm, Paris, Amsterdam, Milan, Rome and Helsinki. Although completely surrounded by water, there are no official passenger services to and from the islands, as distances to the mainland are still large and flying is usually the better option, being not more pricey than it would be travelling over sea. TACV Cabo Verde Airlines provides flights between the islands like Mindelo and Sal. Brava has no services though. The best islands to rent a car are Santiago, Boa Vista and Fogo as they are a bit larger. Still, it can also be pleasant on the other smaller islands if you want to be independent. As some roads might be a bit bumpy, a 4wd is recommended, but an ordinary saloon car is possible as well. Both international as well as local agencies have rental cars. The only public transport is by so-called aluguers which basically are minibuses where you can hop on or off wherever you like. Taxis are only good value within the main cities and towns and between airports and your place to stay. With such an extensive system of internal flights (although a bit pricey), taking a boat is only for the enthusiasts. Although if you want to go to Brava you will need to get a ferry, which takes about 3 hours from Fogo. STM Lines and the Moura Company are the main carriers. For detailed information about routes and schedules you can check this ferry website. Only people from most West African countries (ECOWAS countries), Angola and South Africa don't need a visa. Visas are required. If you are arriving from a country with a Cape Verde embassy, you can purchase a visa in advance. Otherwise, a visa can be purchased on arrival. It's €25 for a single-entry visa and $40 for a multiple-entry visa. The national currency is the Cape Verde Escudo (CVE) = 100 centavos. It comes in notes in denominations of CVE5,000, 2,000, 1,000 and 500 and coins in denominations of CVE200, 100, 50, 20, 10, 5 and 1. There are 10 universities including institutes in the country. The largest universities are: Jean Piaget University of Cape Verde and University of Cape Verde. The official language is Portuguese, used in all official publications and announcements as well as in business, media and schools, but the local language is Cape Verdean Creole (Kriolu kabuverdianu), a Portuguese-based creole language with 90-95% of the words from Portuguese and the rest mainly from West African languages. It is divided into 9 dialects spoken on various parts of the country. Even though Kriolu is comprehensible to a skilled Portuguese-speaker almost all people can also speak Portuguese as a second language. French Creole is not the same as Cape Verdian creole, and a considerable number also speak English; basically, Kriolu is your first option, Portuguese second, English third. European food is common on all the islands. Italian is especially popular on Sal. Vegetarians can ask for omelettes or salads. There are plenty of hotels and guest houses throughout the archipelago. Though the largest hotels are based on the islands of Sal and Boa Vista. Local beer is a lager to drink ice cold, its name is STRELA, but you can easily find international beers and other drinks, including some from Portugal. Proof that you had a yellow fever vaccination is only required upon entering Cape Verde when you have been to an infected country within 7 days of entering the country. It's a good thing to get your vaccinations in order before travelling to Cape Verde. The general vaccination against Diphtheria, Tetanus and Polio (DTP) is recommended. Also both hepatitis A as well as typhoid would be recommended. Vaccination against Tuberculosis as well as hepatitis B are also sometimes recommended for stays longer than 3 months. When staying longer than 6 months, vaccination against meningitis might be recommended, depending on your contact with other people and time of year. Malaria only is present on the island of Sao Tiago, but generally taking malaria pills is not really recommended. Just take the usual precautions, like sleeping under a mosquito net, wearing long sleeves after dark and use spray containing DEET (50%). Although Cape Verde remains a peaceful and safe place with a very low incidence of crime, theft has increased as a direct consequence of tourism. Theft is most common in Mindelo and Praia, as well as at isolated spots on Sal. In Mindelo, tourists can occasionally fall victim to gangs of bag-snatchers, and aggressive begging and pickpocketing are not uncommon, occurring mostly on the waterfront and on the Amilcar Cabral Square. In Praia the speciality theft venue is Sucupira Market, a crowded place and a pickpocket's paradise, but people have had valuables such as laptops snatched from other places in the city. Be particularly careful if using your prized computer in the town squares, where Wi-Fi is often free. In Sal it is Buracona, on the west coast, where the theme is to hide behind a rock and break into cars once their drivers have gone for a walk. In Boavista, in isolated spots, there is an increasing amount of violent crime against tourists. Other islands remain virtually crime-free. In the less populous islands, where everyone knows everyone, the perpetrators are also likely to be known to the police and the locals: this is a massive deterrent in itself. Wifi is not so popular in the guesthouses/apartments. But it's easy to find a sim card with reliable 3g internet (about 5 mbps). 10 Gb will cost you approximately €25. The country calling code to the Cape Verde Islands is +238. To make an international call from the Cape Verde Islands, the code is 00. Post offices can be found in most of big towns of the republic. Visited Santiago, Fogo, Maio, Sao Nicolau, Santa Antao, Sal, Sao Vicente recently. Do ask me about it! I've been in Cabo Verde, Boa Vista. If you need informations about, I'm here. Use our map of places to stay in Cape Verde to explore your accommodation options and to compare prices across the country at a glance. To narrow the results down by budget category, use the links below. This is version 28. Last edited at 12:19 on Jul 10, 18 by Utrecht. 25 articles link to this page.